In April 2010 Anaïs Mitchell released the dizzyingly ambitious folk-opera Hadestown, a retelling of Greek legend set against Depression-era America. One of the underground success stories of the year, it never quite broke through in the manner you might have expected. Critically adored, packed with memorable songs and featuring Bon Iver’s Justin Vernon in a role he was arguably born to inhabit (that of Orpheus, whose sweet voice was said to inspire even trees and rocks to dance), it nevertheless gained a fervent cult following. I call her in early December as she’s making a brief stopover in London to discuss her new album, a fierce yet surprisingly tender collection of songs entitled Young Man in America. Multiple protagonists are again at its helm (though this time Mitchell voices them all herself), and myriad themes, desires and motivations are again explored over its course. Mother and father figures are repeatedly invoked from the outset, its titular character bursts out of his mother’s womb “hungry as a prairie dog” thus beginning his restless search for pleasure and success, while America itself is painted a stark milieu of highways, cities and forests; a “wilderland,” its denizens desperately seeking something more than their lot in life. Something else that only a perfunctory listen to the album reveals is a catalogue of different professions. The song ‘Tailor’ in particular sees its protagonist embark on numerous different vocations in order to please someone else, which I find curious given that Mitchell has spent nearly a decade in the music industry, having seemingly found her calling long ago. The song features a remarkably assured vocal performance – her sharp, distinctive voice now radiates the kind of maturity her early albums promised – finding its narrator something of an empty shell by its close. 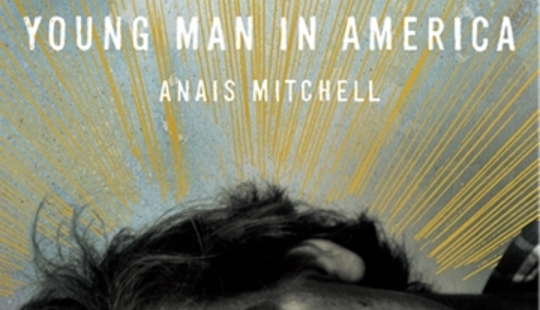 Sadness is something that heavily informs Young Man in America, as on the devastating, elegiac ‘Coming Down’, which abandons imagery and wordplay in order to capture what Mitchell describes as pure feeling: “It’s not very clever, or smart, or anything. I think that we’ve probably all felt that feeling in the midst of a really good time – the imminent end of it, and the emptiness of it.” Indeed, the debauched, Dorian Gray-esque nature of the Young Man’s odyssey is surely not destined to end well, and in ‘Annmarie’, gender roles are reversed as the song’s narrator pleads mercy from his other half. But if tales of obsession, grief and unrequited love form the thrust of the record’s allure, a smattering of hope and beauty among the travails of modern existence round it out. ‘Venus’ is a snappy, addictive evocation of love and lust that sees its titular character descend from the heavens in a “cloud machine,” inspired a little by this as well as “the idea that somebody will swoop in and everything will be okay,” while ‘Ships’ is a rousing closer that grapples with loss in defiant, conciliatory terms. Over the course of our hour-long conversation Mitchell speaks with such eloquence and zeal about her craft and about language and music in general (from old Catalan folk songs she discovered on compilations to the “wild, bizarre” beauty of traditional British and Irish storytelling), and sets out such firm, refreshingly optimistic ideals about the nature of releasing her music independently that it is difficult not to get a little swept up in her enthusiasm. “You just keep going, and see where each one leads,” she states regarding getting her albums out there. With Young Man in America, a literate, sweeping statement of intent and indictment of modern ills both personal and political, you have to hope it leads towards the kind of wider success she so richly deserves.